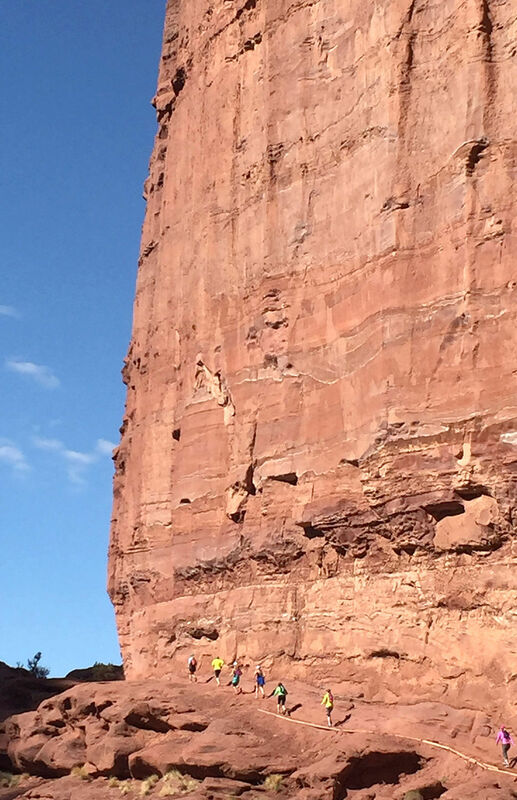 The red rocks around Moab, Utah, tower over participants at the Run Wild Retreat & Wellness Mindful Running Retreat. I ’ve had a rough few months. Among the tools are techniques for improved posture and breathing, We began each day practicing these methods in the cool, crisp desert mornings before heading out on the trails. We also used work sheets to set intentions for each run, such as savoring the calming effect of a run as a way to rejuvenate energy or recognizing our ability to accomplish a physical goal. We also took stock of our exertion levels after runs to see if they matched our stated intents. If a runner’s stated intent was to soak up the sights at an easy pace and yet she found herself breathing hard with effort, for instance, the exertion level probably didn’t support the plan. Fish recommended we continue this practice of matching intent to action in the coming months until we have managed to reshuffle our lives in a way that supports our running. This was my epiphany. When I combined all the negative events of the past few months with a career in overdrive, it’s no wonder that something had to give. Of late, that something had been running. Injury and low energy — signs of stress — led to poor training.